Why are you calling me “BILL”? Pretty sure that is not printed anywhere on my birth certificate. The phone number this was sent to is a Telstra service: first activated in 2001. 0439 is a Telstra prefix. Why the F### ask me? 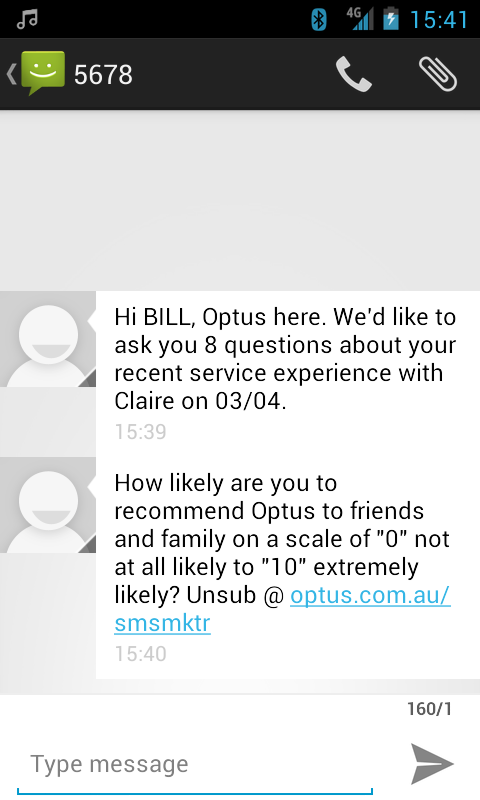 I do have a SIM card that is an Optus pre-paid, that’s installed in the Kite, along-side a Telstra pre-paid. I haven’t turned that phone on in a good month or so (I should fire it up just to keep the battery fresh though). I’d never install that Optus phone in this phone however: pretty sure the phone I received this SMS on is locked to Telstra so it wouldn’t get a service if I tried. Given you can’t get my name right, and you clearly haven’t checked your records properly, let me finish with this: Why would I recommend you?